I was driving through Providence with one of my girls. She was sitting behind me in the back seat. No, I don’t always give money to the homeless, but it happened to be a coincidental truth on this particular day. Honestly, I have had conflicting feelings about giving money to panhandlers. Living in a small community like we do, I hear stories about this panhandler or that one – having a beer at a local bar, or being seen around town “high”. Whether there’s truth to it or not, that’s the story we tell ourselves anyway, isn’t it? That any money we give is just going to be used for alcohol or drugs. That no real effort will be made to turn things around, so why bother? Maybe it makes us feel more comfortable distancing ourselves in this way. To be able to convince ourselves that this person is only homeless because he’s an addict. Therefore, since I am not an addict, this could never happen to me. We kept driving past the man with his cardboard sign. As we approached the next traffic light, there was another man, on another street corner, with another cardboard sign. We stopped, and the man looked at me hopefully. I smiled and pointed behind me. He looked confused until the tinted back seat window slowly eased its way down, revealing my daughter. He looked surprised as he approached the car. 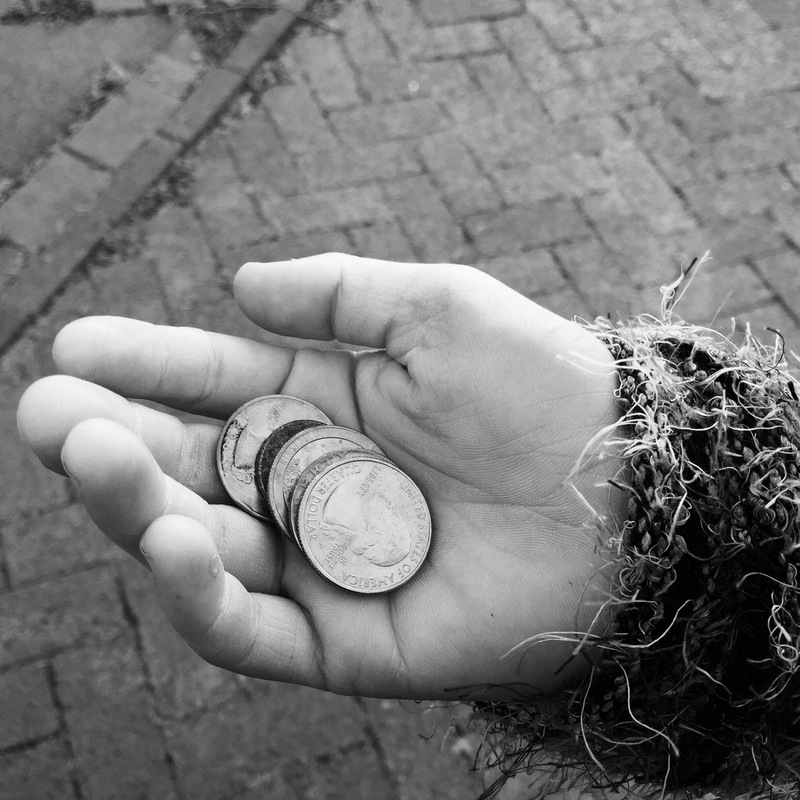 My daughter’s small arm stretched out of the window, and she dropped her change into his cupped hand. He thanked her, and then he turned and looked me in the eye. I don’t think I’ll ever forget the look on his face. He was so moved. It felt as though, for that split second, I could see right into his soul. We communicated wordlessly. This man didn’t get a lot of money from that backseat passenger, less than a dollar in change, but it was clearly meaningful to him. It mattered. You can be a cynic and believe that he went to the nearest liquor store and spent my daughter’s money on the cheapest bottle he could find. Maybe that’s what he needs to do to get by. Anyone who is out on the street corner begging for money, regardless of how they plan to spend it, is struggling. As I write this it seems like a stupid statement, but truly…. Do you personally know anyone who would choose to beg on the street for money? These fellow human beings are out of options, or at least they believe that they are…and they may be right. So, maybe I’m not going to give money to every single homeless person I encounter, but when I do, I am going to let go of judging how that money is being used. Unless I can personally offer that person a viable alternative to the life with which they are struggling, I have no right to judge. I would not want to walk a mile in their shoes. I have also realized that aside from our money – our help, the best thing we can offer the homeless is to acknowledge our shared humanity.